Naturediet Turkey and Salmon treats for dogs are made with freshly prepared turkey using only the highest quality natural ingredients, Naturediet Turkey & Salmon treats are a complimentary semi-moist treat which is highly palatable. 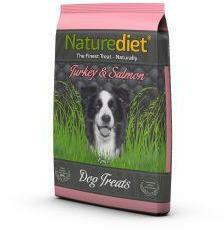 Naturediet Turkey & Salmon treats are formulated without wheat gluten. Our vegetables are carrots.